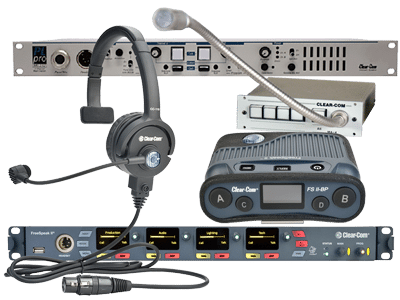 Clearcom is the leader in AV and Performance Audio communications. We rent com systems with two and four channels of wired communications. The beltpacks and headsets plug into the main station with standard XLR cable. These Clearcom wired systems can interface with our new Clearcom FreeSpeak2 wireless system. AV Las Vegas specializes in all types of pro audio PA equipment rentals.